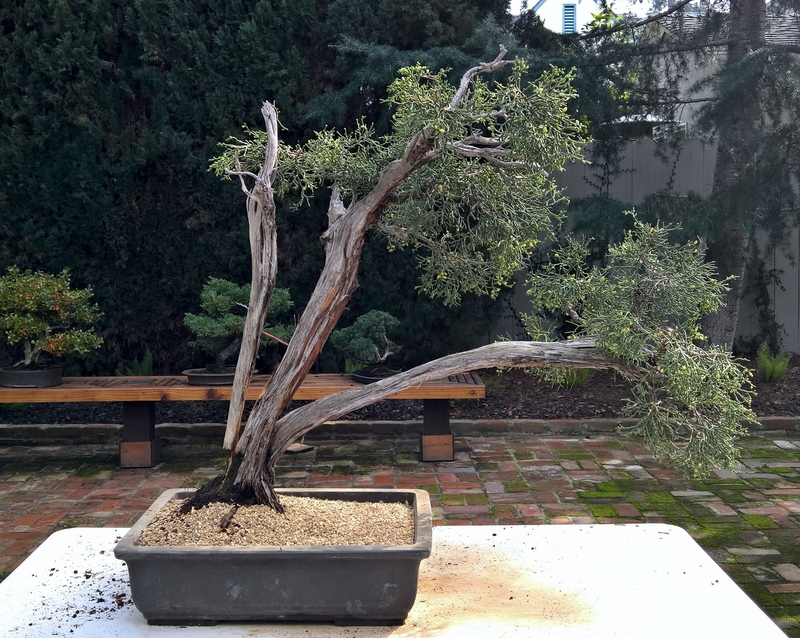 Today, we had the opportunity to reinvent an old tree. Seven years ago a client’s collection came up to the Bay Area from Southern California. 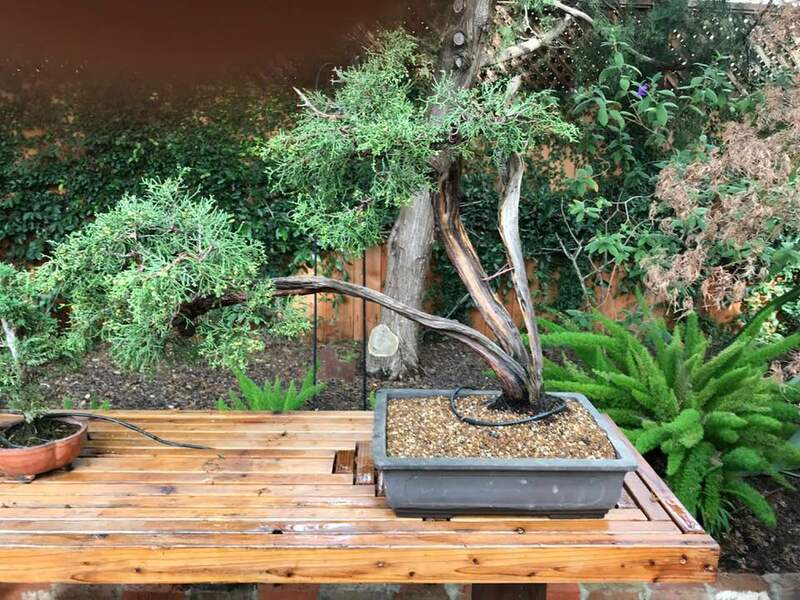 The collection was in dire straits have been neglect due to the owner’s poor health and the client wanted to save the trees. I am so glad she chose to do that. When they arrived here, many had not been re-potted for countless years, all suffered from poor soil and poor watering. The first thing I did was to up-pot or emergency re-pot to save the trees. I had to create drainage, unlock the trees from the pots so water could get to the root ball and often did not have a better pot to place the trees in at at that time. As the years have gone by, I have brought new pots for the trees to the client and improved the collection. Trees that had barely any foliage exploded with new growth. Today the trees look completely different from their original form but I have usually tried to honor the original style but not always. This brings us the the project of the day. 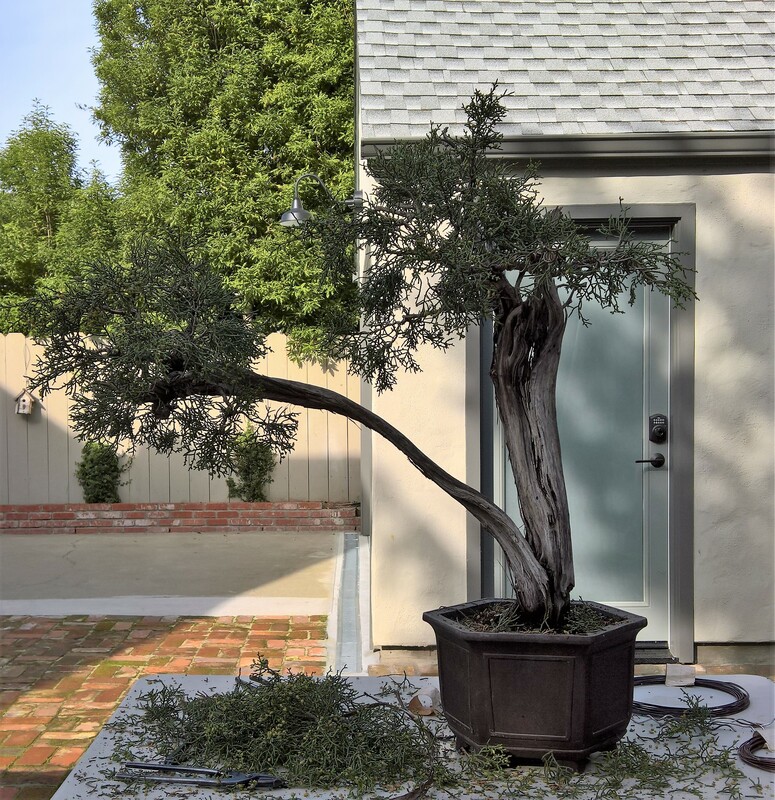 The California juniper arrive as two trunks in a small cascade pot. 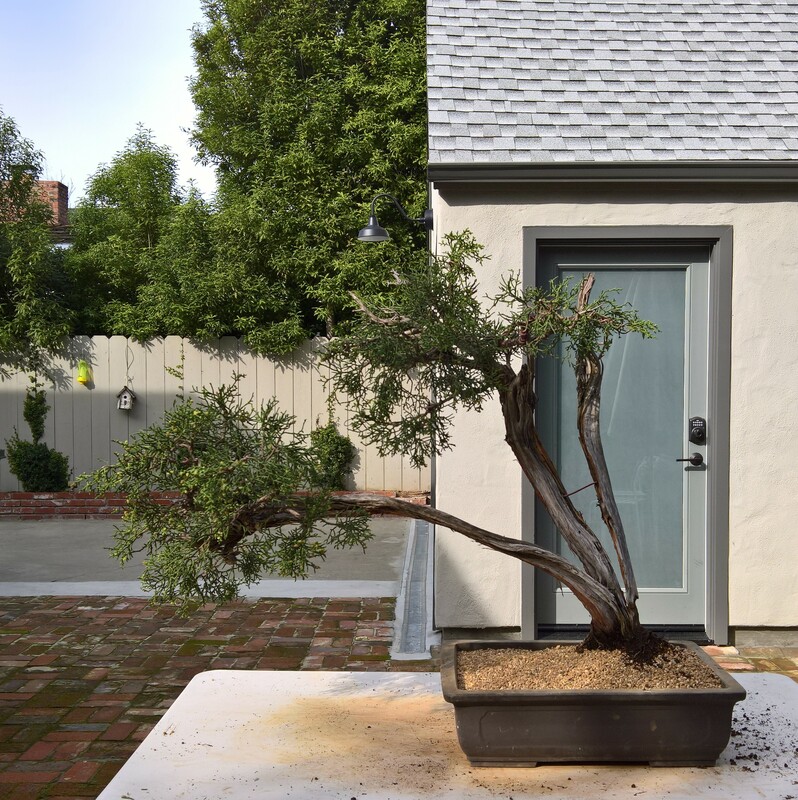 After the tree acclimated to the new surroundings I chose a new pot for the tree that would allow for extensive root growth and recovery and waited to the tree to tell me it was ready for work. I have consulted several of my local teachers on a possible design of the tree. The upright nature of the tree was just not very pleasing having two trunks not talking to each other. 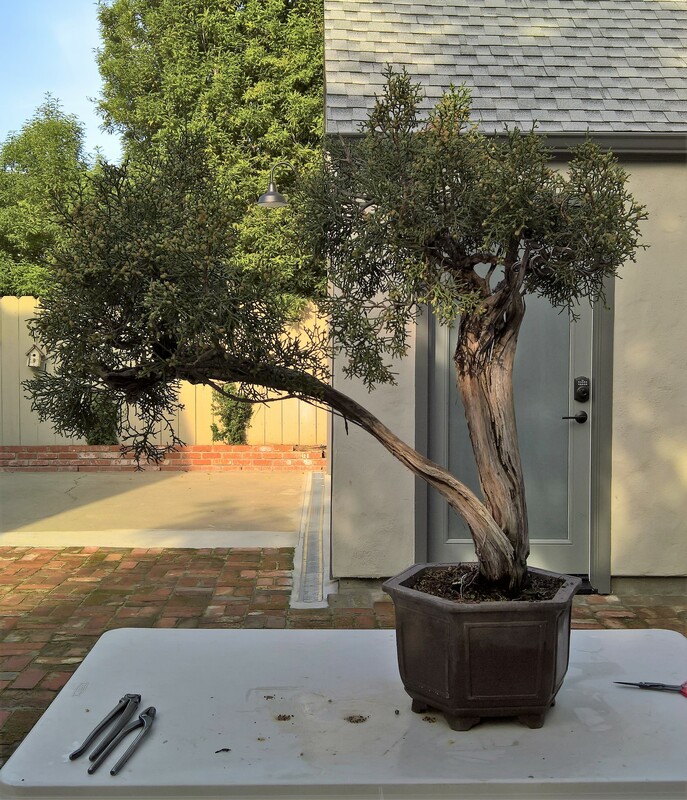 Original tree design as it arrive from SoCAL. Note the cascade pot. 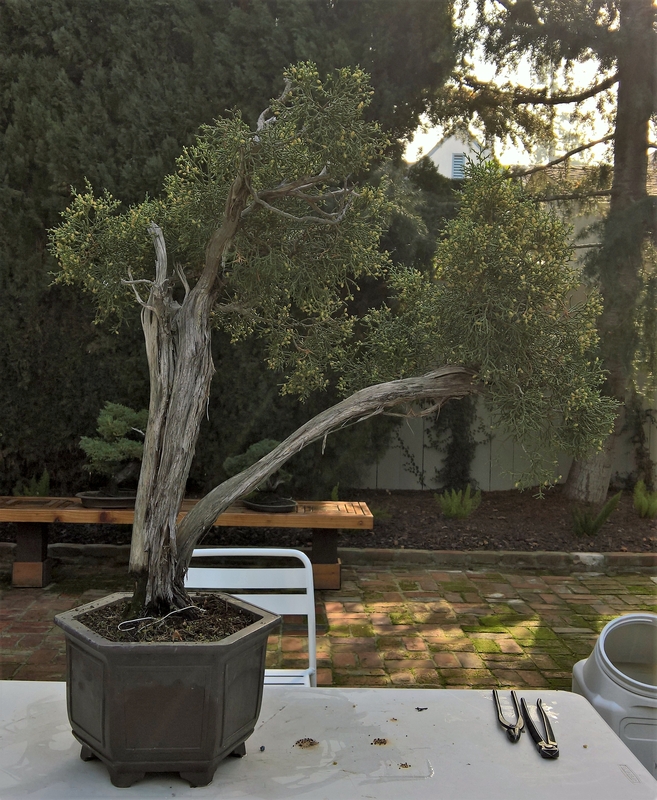 It is amazing that a tree of this size could get health in such a small pot. The work is being done because the foliage has recovered. When it arrive from the south there was very little green left on the two trunks. The goal now was to create a design that allow the branches to tell a more realistic story of how they would grow in the deserts of SoCAL. Having been on a dig for these beautiful trees, I knew we need to honor that image of the wild. The new pot, frees the root ball from this tight cascade pot and will allow them to grown horizontally as we need them to. New pot. 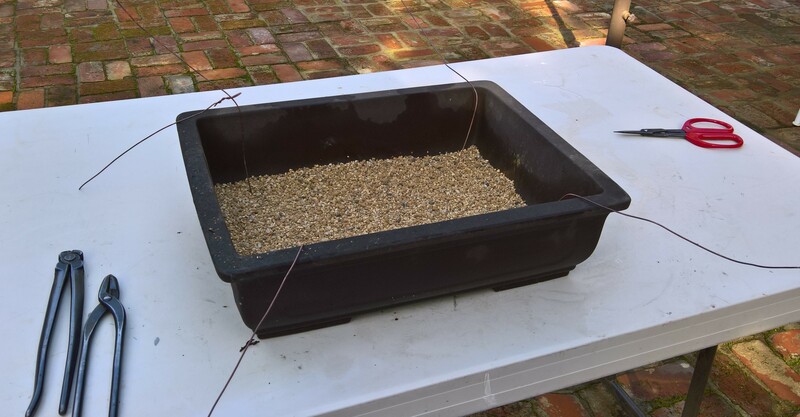 This is a large rectangle pot that has a about a 4+ inch depth to hold the root ball. Our goal was not to bare root and not to cut much root from the tree at this time. Next, we had to work on the foliage. A foliage reduction of the unruly mass had to be done. We cleaned out dense areas where too much material came from one location. We also wired out branches that flowed into the new design. The foliage path needed to flow out in the direction of the new position and a new distinct apex was needed on the two living trunks. Original tree design. Foliage reduction and basic structural wiring. Rear view of the original design. Rear view after branch reduction. So my goal was to split the trunk (separate deadwood trunk from the live line) and create a three trunk tree. This would allow me to later preserve the dead wood which was suffering from termites and rot. After splitting the trunk evidence was found of termite damage in the main trunk. That will be sealed and preserved soon when the wood has time to dry out. I will use a brush to clean the wood and then preserve it with PC Petrifyer. The separation is being held in place for the time being with a copper pin that brace the two trucks away from each other. Next was to change the orientation of the tree, lowering the flying branch to the left and giving space to the other two trucks, thus creating a standard triangle form of the composition. New orientation, new front, three trunk view. Foliage needs to develop now. 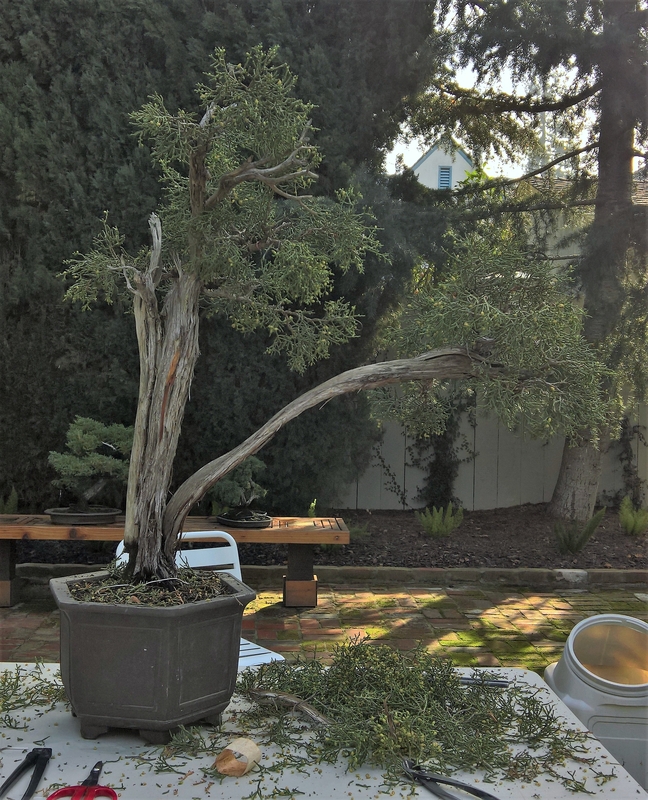 Some wiring has been done after branch reduction. The placement of the tree will now allow root development and foliage expansion. The tree is now ready to start a new journey for future development. As always, these these project never end on the first day; rather, take years of development and finesse. The tree is watered in and will rest and recover from the work before the next phase begins.